If you want to marvel at some Egyptian mummies, check out some Chinese ceramics or study some still-life paintings, you'd go to the Ashmolean. If you want to enjoy a post-work drink with a difference, accompanied with a tapas-style bite to eat, turns out you'd go to the Ashmolean too. A prestigious museum isn't the first place that springs to mind when you think fine dining, but in-the-know Oxford residents have been enjoying the Ashmolean's top-floor restaurant since the museum's extensive re-fit finished in 2009. With lavish lunches and afternoon teas on offer during gallery opening hours, the Ashmolean Dining Room transforms on Thursday and Friday nights. Step through the concealed doorway on St Giles and take the lift skywards: an evening on the roof terrace awaits. The restaurant itself is full of light, with floor-to-ceiling glass windows maximising the view of the historical Randolph Hotel and beyond to Oxford's famous spires. One of these windows is a sliding door, opening onto the terrace. Thanks to our wonderful British weather, this terrace is sadly under-exploited for much of the year, but once summer rolls around (hurry up, would you? ), this space is the place to be. There's an extensive area of decking with tables and chairs for informal dining, plus a patch of real grass with deck chairs that's perfect for lounging after a hard day's work. In addition to a well-chosen wine list, a selection of wines and beers, the Roof Top menu also offers three appropriately-named cocktails: the Randolph, the Oxford Fool Sling and the Rooftop Daiquiri £6 each). N, D, M and I tested the range between us, with the vodka and cointreau Randolph and the rum-based daiquiri winning particular praise. The watermelon flavour of the Randolph makes it the perfect summer drink. Sadly the weather on our visit didn't quite fall into the 'perfect summer' category, but we didn't let a spot of rain stop us from ploughing through the entire food menu. With dishes designed to be shared, the Roof Top's is ideal for a sociable post-work bite (or what I like to all a pre-dinner dinner). Or, if you order everything on offer as we did, you'll have more than enough for an evening meal. The select menu features a range of 'small plates', priced £4 each or 3 for £11. There are also sharing boards featuring either meat or cheese or a combination of the two for £14.50 a pop. These nibbles are definitely pricier than a bag of crisps down your local pub, but they're also a damn sight tastier – and more filling. 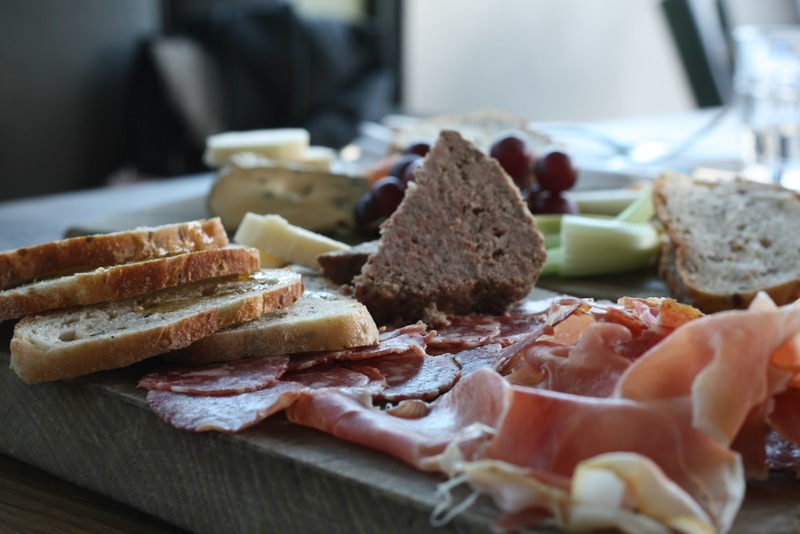 The meat platter consists of Serrano ham, wild boar saucisson and paté de campagne, served with pickle and hunks of bread. My meat-eating friends assured me the high-quality ham was sliced in house rather than pre-packed, and raved about the smooth texture and flavour of the paté. The cheese board, with its helpings of Manchego, Coat Hill blue and Isle of Mull Cheddar accompanied by bread and homemade quince jelly was more up my street. The presentation of both was excellent, and although I initially thought £14.50 seemed steep for a sharing board, a generous portion between 4 people turned out to be good value. The cheese theme continued with feta and basil filo parcels: generous chunks of feta encased in pastry and topped with a drizzle of red pepper sauce. Diet-friendly they're not, but who cares when cheese and pastry taste so irresistible? Waistline-watchers wouldn't fare well with the pork scratchings either: D observed that 'each bite needs a 10k run'. An indulgent, more upmarket take on the bar snack, these homemade scratchings were huge. Served hot, they were so crunchy I swear passers-by at street level could hear our trio of carnivores polishing them off. N wasn't such a fan, saying she'd rather see them served bite-size than in the current stick form, but the boys seemed to enjoy them. The smoked mackerel paté was a universal hit: smooth, creamy and flavoursome without being overpowering, not a sliver was left at the end of our meal. 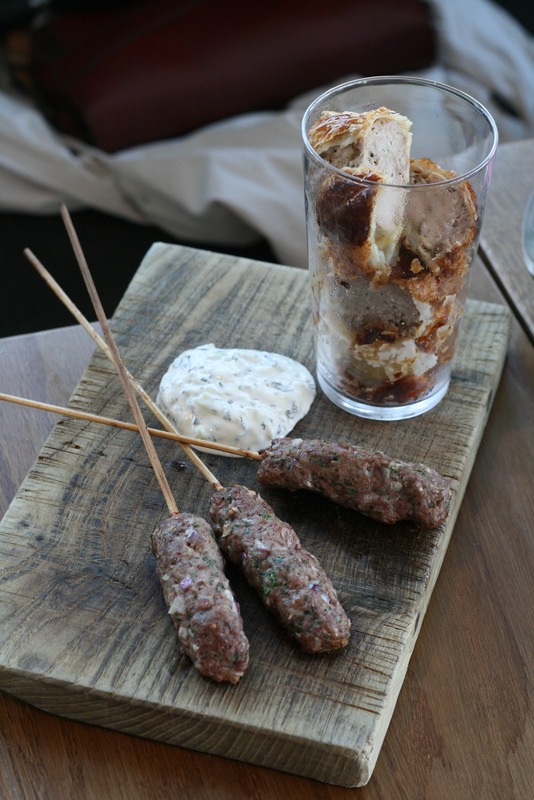 The lamb koftas served with tzatziki also went down a treat with the meat-eaters: the lamb mince was mixed with red onion and parsley and apparently tasted incredibly fresh. Everyone thought the mince mixture had been prepared in-house. Also homemade were the sausage rolls served in a pint glass. Novel presentation didn't win any brownie points from this crowd, though, with M commenting that they seemed incongruous on such a sophisticated menu. 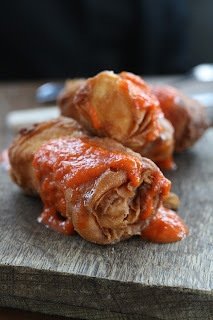 They weren't exactly your standard sausage roll, with fresh, flaky pastry rather than the usual greying, gluey texture, but even so, they were far from the most popular meat dish. A surprise star was the selection of continental breads served with balasamic vinegar and early harvest olive oil. It's hard to praise such everyday items as bread and oil, but the combination served here was delicious. The oil and balsamic mixed perfectly, reaching a viscous consistency that didn't drip everywhere like most (and believe me, clusmy diner that I am). With a well-priced, tasty selection of nibbles in an exclusive setting, the Ashmolean Roof Top is a winner in my eyes. If the weather would just have a word with itself, I'm sure the terrace would be packed with a post-work crowd looking for an alternative to a British beer garden. With its huge deck and great views, the Ashmolean's terrace feels much more continental – a feeling its well-chosen, Mediterranean-influenced menu only enhances. The Ashmolean Dining Room is accessed via the museum (entrance on Beaumont Street) during opening hours. In the evening, use the St Giles entrance. Excellent photos by Marc Troughton, who's much better with a camera than me. Interesting post. Can I ask how you have found the service? I've eaten at the Ashmolean Roof Terrace twice and both times the service was very poor. In fact, on the second visit the service was so appalling I sought out the manager and complained - the only time I have ever done that (and I've eaten at the Harvester at solstice park), hence I would not eat there again. Shame, as it is an impressive venue. Oh that's a shame - the service was good when I was there. Definitely right to bring the manager's attention to that. Hopefully things will improve! As an art student researching the work of the Impressionists, I have big help from this site called wahooart.com. It's like a good art library, where, convenient for me, works of artists are divided into art movements in history. Some of the works I had never seen before.